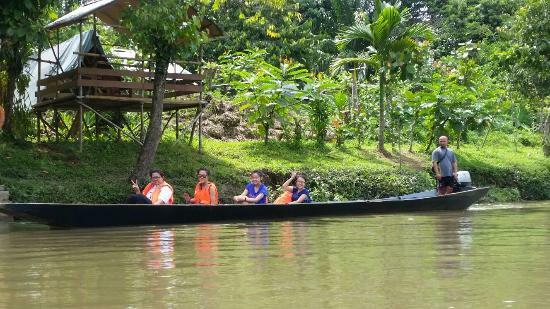 Sumbiling Eco Village (SEV) is amid one of the best preserved tracts of primary rainforest in all of Borneo. Is Ecotourism a solution for sustainable tourism? Who is the person who have helped to develop SEV? How does the development of Ecotourism benefit the local people? Read the article below on how preservation is a challenge to the popular Angkor Wat tourist attraction in Cambodia. Another article on how Ecotourism can promote sustainable tourism. Richard Gunting, a leader of one of Borneo’s indigenous tribes, aims to create eco-tourism in Sabah, an area full of rich biodiversity and pristine forests. - Eco-tourism is used to open the door to the indigenous community by involving the community from the very beginning. - The project is called Orou Sapulot and is based around a comfortable and traditional wooden longhouse for guests and a community farm. Agar wood is grown alongside cocoa plants and fruit trees of papaya, guava, soursop, mango, pineapple and pomelo. Newly formed ponds home tilapia and valuable palian fish to eat, sell and distribute. - Not only can this help to feed visitors, but also educate them and locals about the potential of sustainable agriculture. who might be otherwise be drawn away to live a more contemporary life. 0 Response to "Ecotourism for sustainable tourism"